Jeremy English is back with the second book on Modelling the Southern. 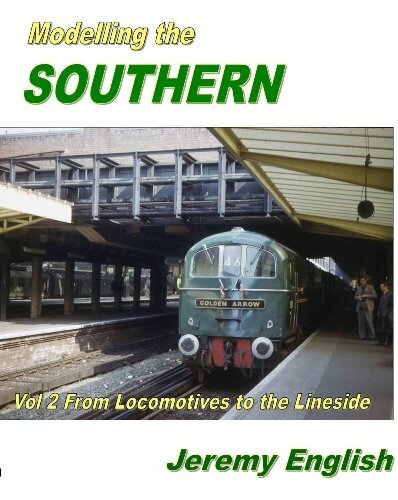 Modelling the Southern Vol 2.From Locomotives to Lineside is another must for the Southern fan. The Southern Railway was long neglected by the big model railway manufacturers, but over the last few years this has changed. There are an increasing number of steam era engines, particularly from Hornby, and a wide selection of the ubiquitous EMUs now available. The Southern Railway and British Railways Southern Region are now more popular amongst modellers than at any time I can recall. Simply owning the right engines and rolling stock doesn’t automatically mean you have a convincing Southern Railway or region layout. The devil is as always in the detail and those little touches that give a sense of location and time are of paramount importance. Thats why books like this are essential reference guides. Jeremy English has now given us two volumes looking at the Southern purely from a modellers perspective, so there are no longer any excuses for not getting it right. The book offers the modeller ideas and ways to recreate the “essence of the Southern” by means of informative text and photographs of the prototype and of models.To assist the modeller, both experienced and beginners. Volume 2 is very similar in format to volume 1 but Jeremy places some additional emphasis on EMUs, signalling, sample layouts and lineside structures. As before, prototype plans are included as well as examples of some of the best Southern models and layouts of recent years. A wealth of photographs, in both colour and black and white, compliment what will be a ‘must have’ modelling title for the enthusiast. While this reviewer is very much a modeller of railways “up north”, I still love to see layouts that provide convincing scenes of London south of the Thames with endless miles of trains on elevated track. I also love the wartime setting on Pete Goss’ Rowlands Castle, which I regard as the best Southern based layout of recent times. AS Christmas approaches this is a good one for the wishlist, and will go very nicely under the Christmas Tree with the latest Bachmann EMU.